Frantic Mama is not a food blog. Not at all, really. However, my friends, when I come across a recipe I love, I feel compelled to share it with you. Are you obsessed with all things peanut butter? How about dark chocolate? And are you still besties with carbs? Me TOO! 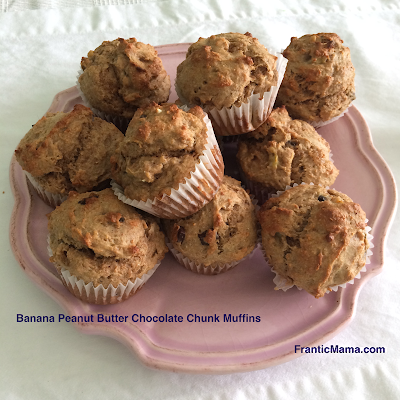 I found the original recipe for these muffins at Flavor the Moments, but with a little improvising and creative adding & substituting, I gave them my own twist. Better yet, I didn't need to buy anything to make them right then and there (I was inspired to bake something due to some browning bananas I didn't want to throw away. I'm avid avoider of the food-wasting-guilt!). Line a standard muffin pan with paper liners. In a medium bowl, whisk the sugars, oil, egg, and egg yolk until frothy, about 1 minute. Whisk in the mashed bananas, peanut butter, milk, yogurt, and vanilla until well incorporated. Fold in the chocolate chunks and walnuts. Scoop the batter into the paper liners. Not the easiest recipe in the world (there's lot of stuff in these! ), considering I am usually perfectly content buying my baked goods or using a mix. But if you enjoy baking, and find yourself with one of those rare blessed hours all to yourself, I highly recommend giving these a try. Do you have a favorite recipe blog or website? Is there a favorite cookbook you use again and again? Do tell! P.S. Would you consider taking a minute to share Frantic Mama on Pinterest, Facebook, or with a friend? The more people I reach and hear from, the more fun blogging is for me! We can also connect here: Facebook, Twitter, Instagram, & Pinterest. Sounds yum!! I bake every weekend and send tiny pieces of cake or a cookie in lunch boxes through the week. Along with the healthy stuff of course.We love the banana chocolate combo too!! And my kids lick peanut butter off spoons so I never get to bake with it. Do try smitten kitchen's chocolate banana bread and if you'd like to go savory she has a black grape and olive crostini that because I just got reminded I need to make now!! And also the milk and honey bread over at the slow roasted Italian. It's so soft it melts. I must be sounding so excited!! Well ,I love food! And I love it when my favorite blogger talks about food!! How adorable that you send little treats in their lunchboxes! I bet your family loves it :). I will look up Smitten Kitten! I've never heard of it before. Chocolate banana bread sounds right down my alley. And good for you that you bake each weekend. I think baking is one way to be creative, and I used to do it a lot before having children. Now I often pick writing for my creative time (since there is very little time allotted to "me time" these days!). However, after making these delightful muffins, I might try to choose baking instead from time to time!